Mechanisms used in filtering water will depend on potential usage of water. 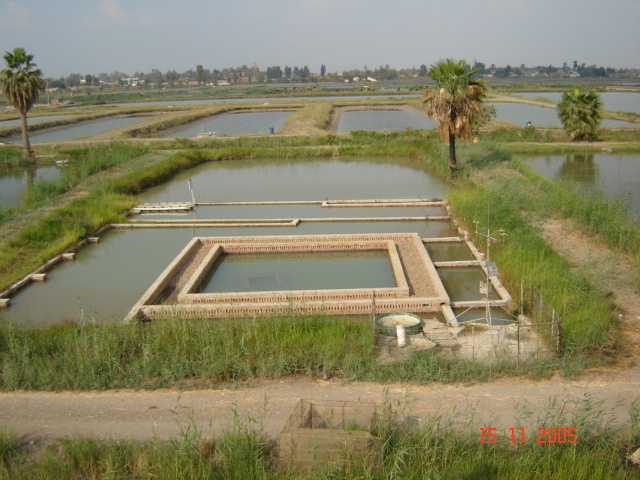 This photo shows a type of gravel filters whereas filtered water is used in tilapia hatchery as well as for landscaping. This filter is located in 1000-m2 earthen pond. The filter is established above concrete base. The outer dimension of the filter is 10×10 meter. Filtering body is one-meter wide. Gravel used in this filter is used in construction of a local known name “pheno” that is suppose to have an average size of one centimeter as the length of gravel. The depth of the filter is 1.25 meter. The filter require periodical maintenance where filter gravels are taken out, washed while overturning it before stocking it back. This operation takes place twice/year and done to match particular activities such as tilapia spawning. Supplemental structures such as current breakers could be placed ahead of the filter which would help in settling suspended particles and enhance the efficiency of the filter. Also, the reading of water transparency using a Secchi disc when carried out in filtered water (in the middle of the filter) would tell about the filter efficiency and indicate whether maintenance of the filter would be required or not. It needs to be noted that water movement inside the filter would depend on the discharge of filtered water which takes is pumped from the middle of the filter. This particular filter is located on the premises of World Fish Center, Abbassa, Egypt.